A message from Philippa Kafka: There are some amazing older women out there! I received a message from Philippa Kafka one of the contributors to Women Confronting Retirement: A Non-traditional Guide. Your comment made my day! Thanks so much. I am now 76, my husband, 62 (he retired with me) and we have been retired ca 10 years. My last publication was in 2005, but I seem to have lost my desire for scholarship. I am working on my memoir in a most desultory fashion. I began editing, reviewing, judging submissions for a feminist journal in 1998, before retirement. I love it. Yes, we are still restoring/upgrading houses, my husband, seven days a week, myself only a few hours at a time. I kickbox twice a week, the oldest woman, by far, in the class. My husband is generally the only male in the class every time. I also do zumba twice a week, but a few older woman are in these classes because women love to dance and jump around at any age. Again, my husband is generally the only male in the class. I believe that the older we get the more we should be physically active. I jump into the air more and higher with every "high" call than the teacher even in order to attempt not to limp slowly like the majority of my age cohorts and younger. My legs feel like steel rods. Your garden is lovely. Our last iris here in the CA project just wilted, but our roses here are beautiful, and the roses in NV(our primary home) were spectacular when we left. Here's some pix. 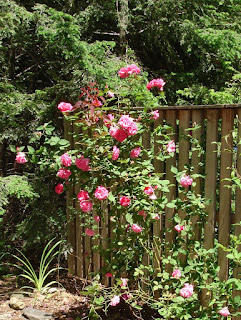 The rose garden pictured is in our NV home. Enjoy your retirement to the fullest!!!!! I recently recently discovered Women Confronting Retirement: A Non-traditional Guide, a collection edited by Nan Bauer-Maglin and Alice Radosh. The book has helped me think through my approach to my retirement years. The contributors are mostly white, middle class professional women. For the most part, these are women who can afford to finance (at the least) a modest retirement. They all write well and their stories are sometimes gripping. No surprise, I was most interested in accounts of retired teachers. They confirmed my belief that teachers are especially well equipped to deal with the unstructured time of retirement. We have invested a lifetime in reading, writing, learning--self-directed pursuits which can be engaged in independent of institutional affiliation. Also since we’ve had so much time off, we’ve had a lot of practice for retirement. One of my more cynical colleagues said to me: "Why are you retiring? You have a 3 day schedule for 28 weeks of the year. That leaves plenty of time for all the things you want to do. Why give up the paycheck?" To those already retired, I say, “It’s a big world, follow your passion and seize every moment. Come on in, the water’s fine. Can’t swim? Don’t worry; there’s always someone willing to coach you.” In conclusion, I have to say I have been truly blessed with good health, a loving family and an abundance of sincere and caring friends. I’ve had similar thoughts but never expressed them so well. For me, keeping the melancholic streak at bay is my major challenge in retirement. I do not fear unstructured time. I’ve always been the busy little beaver, developing new course, new projects, and building new organizations. There are more activist projects/writing projects than I’ll ever have time to complete. There are so many books to read, languages to learn, friends to re-connect with—-not to mention all my garden projects. I am not worried about too much time on my hands. I am worried about thoughts of the future—aging, illness, loss, death-intruding on present happiness. Aunt Sally would never have let that happen. So I am trying to cultivate whatever inner Aunt Sally I might have. My husband and I celebrated his 68th birthday in NYC last week and saw the magical new production of Joe Turner’s Come and Gone. Luckily we got our tickets before the Obamas went and had great seats. My husband thought the first act was too diffuse and needed editing. Maybe so, but I loved every minute of it. My husband and I are both kind of shell-shocked by these numbers: 68 for him and 65 for me in September. How to slow down the time? I’ve noticed when we have spent 3 weeks on a vacation to a foreign country it often seems like much more than 3 weeks. When I am at home during the summer, doing nothing in particular, 2 weeks can disappear in a flash. I think there’s a lesson here. Of course we can’t afford to be traveling around the globe most of our time! But we are thinking of ways to stretch our resources to get to NYC more often. My husband loves New York and if we could afford it, he would want to retire to the isle of Manhattan. I always feel more alive when I’m in NYC, but I wouldn't want to live there--too frenetic for me. My beloved Philly is just about my speed. But good as Philly theater is, it’s not Broadway . We usually go to NYC about 4 times a year and need to figure out ways to do it more often (and thus more economically). Any suggestions would be much appreciated. Well I will have to wait another year to see my Iris and my peonies again. My irises were finished last week and my last peony bit the dust yesterday. Beard Iris have that indescribable fragrance that I cannot get enough of. True, there are re-bloomers that sometimes come back in the Fall but that’s not when I want that intoxicating Iris fragrance. My first bearded iris appeared in the first week of May and the last one to bloom, Beverly Sills, departed my garden on June 3. 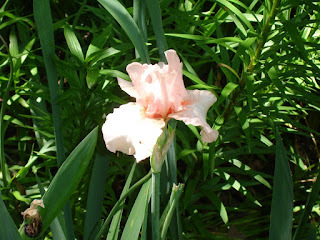 This has got to be one if the most beautiful irises of all time-–a pale peach color with a fragrance to die for. I’ve often wondered if the real Beverly Sills appreciated the magnificent iris named for her. How many more years will I see Beverly return? I try to banish those stupid, morbid thoughts. For me, one of the challenges of the retirement years is to stop thinking like this. Such thoughts sure don’t buy us any more time. I finished cleaning out my office on Thursday. Now I can finally relax and smell the roses. I handed in my keys and finished cleaning out my office on Thursday. Now I can finally relax and smell the roses. I managed to reduce the contents of my office to 2 boxes and the last box was removed on Thursday. When I first began sorting and sifting, I thought a lot about what I would throw away. Yesterday I stopped agonizing and threw most of the stuff in the trash. I finally finished all the retirement paperwork-—running around to various offices getting signatures attesting that I don’t have any college library books, audio-visual equipment, computers etc. in my possession. So it is finally all over. I never expected the process of retiring to be so much work! The busiest time of the year for gardeners is the busiest time for a teacher. My semester ends the beginning of May, so I have had little time for gardening in April. Usually by the time I have gotten through final exams, collapsed from absolute and total exhaustion for a few days, it’s mid-May. The weeds are already out of control and it’s too late for all those hostas I wanted to divide, all those perennials I wanted to move around. This happens again in the Fall as I desperately try to divide perennials, cruise the garden centers for fall planting bargains, plant bulbs, at the same time as I have all these classes to teach—-not to mention my volunteer projects. It became clear that some thing had to go: my job, my garden, my volunteer work. Since I get most satisfaction from the garden and the volunteer projects (more about that later), it was clear that the job had to go. Too bad the pay check has to go as well, but at this stage in my life time is so much more valuable than money. Well, back to weeding. It sure beats grading papers.